Zipcar, much like Car2Go of the past, is a car-sharing service. It allows you to rent a car by the hour or by the day. It all works via a card that you apply for online. Once approved, you will get your very own Zipcard (see what they did there?) in the mail, and you can use that to unlock and drive Zipcars. Each car in the service has a card reader installed on the windshield, so all you have to do is swipe your card and you are good to go. The keys are left in the car for you, and you just get in and drive. Once you are done with your journey, you must return the Zipcar to its dedicated parking spot, and lock up with your card. As far as rates go, currently the typical Zipcar costs $8.50 per hour or $74 per day (Though Ohio State students can sign up for free today and get $15 in drive credit with the new deal). Honda Zipcars will come in all shapes and sizes, ranging from the minivan Honda Odyssey to the compact sedan in the Honda Civic (pictured). Image courtesy of the author. All of the new Zipcars in Columbus will be brand new Hondas, straight from the factory in Marysville. The fleet includes mainly Honda Civics and CR-V’s, with also some Honda Odysseys, Honda Fits, and Honda HR-V’s. There will be multiple new locations scattered around Ohio State University, with a few other new Zipcar locations featured throughout Downtown Columbus, the Short North Arts District, south of Downtown in the Brewery District, and at John Glenn Columbus International Airport. 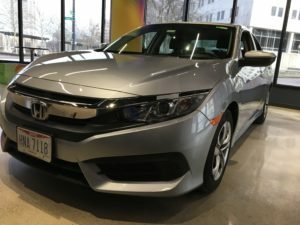 I inquired to see if Zipcar and Honda plan on bringing a car or two to Capital University’s campus, but as of right now they seem to have no plans of bringing the service to Bexley or Capital’s campus. That very well could change if they see demand in the area, though. Another interesting aspect of this announcement is the partnership between Zipcar and Smart Columbus. 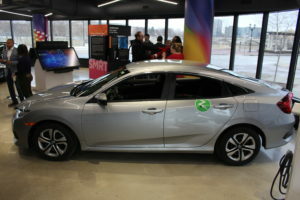 The press event was held at the Smart Columbus Experience Center, and it seems like one of the reasons that Zipcar decided to jump into the Columbus market was because of all the exciting developments happening with the Smart Columbus initiative. As far as the partnership goes, Zipcar is looking to utilize information from the Smart Columbus Operating System as it heads into the future and thinks about how to better help address mobility problems in the region. This may mean utilizing the data to strategically place new Zipcar stations in areas of need, and could even lead to a partnership in pursuing autonomous car technology. The Future: Autonomous Cars, Electric Cars, and Fewer Cars? The idea behind ride-sharing services like this is for people to drive less. Mark Patten, Vice President of Smart Columbus for the Columbus Partnership, stated that Smart Columbus has a goal of “10 percent reduction in single-car commutes across the region”. For them to achieve that goal, ride-sharing services such as Zipcar will play a vital role. Another step in that process might be getting Columbus commuters to ride autonomous cars. Currently, there is a system of Waymo autonomous cars in a loop at the Scioto Mile, but as time goes on, there may be opportunities for more autonomous car systems. Places like Easton, The Short North, and even Ohio State’s campus may benefit greatly from having around-the-clock autonomous shuttle service for commuters in need. All of these efforts to get people driving less are combined with the push by Smart Columbus to accelerate adoption of EV’s, further reducing the carbon footprint of Columbus drivers. It will be interesting to see how the announcements of today along with the pursuits of Smart Columbus change mobility in Central Ohio moving forward. For now, this is a big step in the right direction for a more sustainable future.